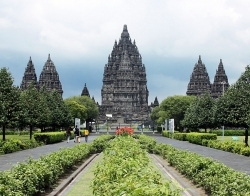 In the old days of Java Island, in a region called Prambanan, lies two kingdom. Kingdom of Pengging and Kraton Boko. Pengging kingdom is gifted with a fertile and get prosperous. The kingdom is lead by a wise king named Prabu Damar Moyo and has a male son named Raden Bandung Bondowoso while Kraton Boko is a kingdom that obey under the rules of Pengging. The Boko king is very cruel, he is strong and tall, like a giant. The people of Boko always afraid of the kings anger. Although the king were not handsome, he has a very beautiful daughter called Princess Roro Jongrang. One day, the king of Boko wants to rebels against the Pengging. Lead by the Boko prime minister, the giant race, Gopolo, the Boko army is prepared to announce the war between Boko and Pengging. They even raid its own people's properties to support the campaign. Fierce war happens in the borders of the Pengging teritorial mark. Many victims were falling on both sides and people Pengging be suffering because of war, many people hunger and poverty. Knowing his people suffer and have many victims soldiers who died in the borders, then Prabu Damar Moyo sent his son Raden Bondowoso go to war against King Boko. The young Bondowoso is able to defeat king Boko. Seeing the king died, then Prime minister Gupolo escape. Raden Bondowoso pursue Patih Gupolo to Kraton Boko. After reaching Kraton Boko, Patih Gupolo reported on Princess Roro Jonggrang that his father had been lost in the battlefield, by a knight named Raden Bandung Pengging Bondowoso. Princess Loro Jonggrang wept, saddened his heart because his father had been killed on the battlefield. Raden at Kraton Boko Bondowoso arrived, soom he troubled to see Puteri Raden Bondowoso Loro Jonggrang beautiful, so he wanted to marry Princess Loro Jonggrang as his wife. As the Boko kingdom is lost in the rebels, and o save her fathers kingdom, the Loro Puteri Raden Jonggrang accept the princes, with some request. She did not want to marry Bondowoso because he had killed his father. To reject the proposal Raden Bondowoso, then Princess Loro Jonggrang have a strategy. The first request, Princess Loro Jonggrang asked for Jalatunda wells (very deep well) while the second request, asked for him to make 1000 temples in one night. She ask Raden Bondowoso the second request, to make 1000 temples in 1 night. Bondowoso then command his workers from genie tribe to help him build the 1000 temple. The 1000 temples are building up, one by one with the help of the genie tribes. The princess wants to sabotage the building of the temples. She asks her servants to pound the rice pounding tools and also burns lots of paddy's straw . Because of it, the roosters crowed. The genie take a lookto the sky and its brighter in the east. The leader of the genie reported to Bondowoso that they have stopped to make the temple because the morning has arrived. Princess Roro Jonggrang told to count the temples and its only 999 temples, not 1000. So, Bondowoso won't be able to marry the princess because he failed to complete the request. Being deceived and tricked, Raden Bondowoso angry and curse Princess Roro Jonggrang. "It's missing one, and you that should fit the numbers". The princess is soon turned into a stone statue; it is exist in the heart of the Prambanan temples until now.